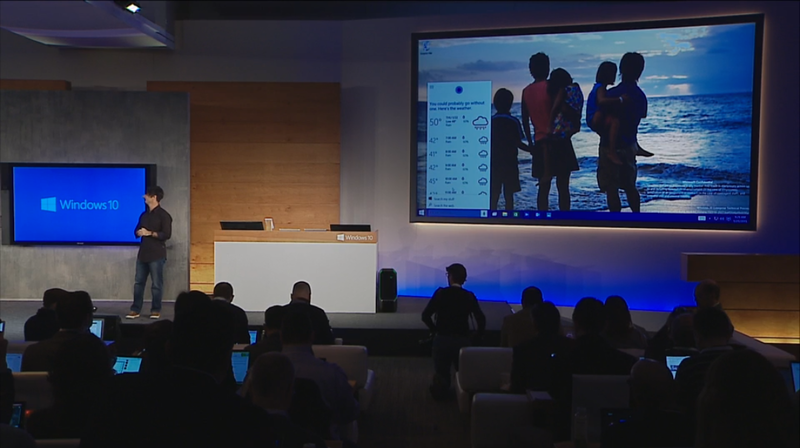 It’s official, folks: Windows 10 is coming to the people. After kicking off Windows 10 with a bevy of business-friendly features, Microsoft drew back the curtain on the operating system’s new consumer-focused features at an event on Wednesday, while simultaneously driving home a vision of an operating system designed to deliver a singular, cohesive experience across a myriad of device types. And it'll be a free upgrade for Windows 7 and 8 users, who can snag the operating system for nada in the first year after Windows 10 hits the streets. 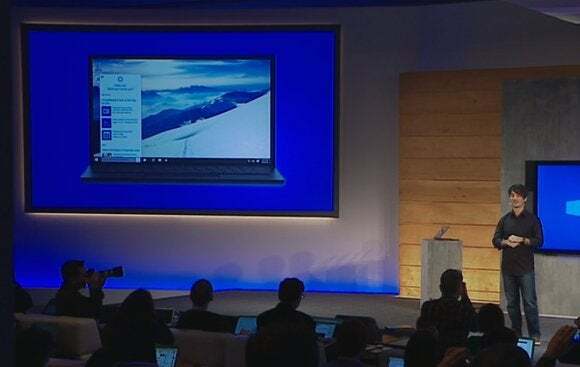 After Microsoft operating system chief Terry Myerson announced that crucial tidbit, Microsoft’s Joe Belfiore took the stage to run through some features coming to Windows 10 Preview that are designed to make using the operating system a smoother experience. First, Belfiore showed off some helpful tweaks to Windows 10 features that have already been announced: The Start menu will be able to expand to fill the full screen if you desire, for one thing. The Action Center (read: Windows 10’s notification center) is receiving improved functionality, such as Windows Phone 8.1-esque quick action buttons that let you activate features (such as Bluetooth and Wi-Fi) with a single click. Notifications in the Action Center will be able to be expanded. More helpfully for everyday workflow, Windows 10 will condense the Control Panel and the modern UI PC Settings into a single interface, eliminating Windows 8’s maddening insistence on dumping crucial system tools into two separate locations. Microsoft also announced that its Continuum feature, which dynamically shifts the Windows 10 interface from the Modern UI to the desktop depending on whether you’re using a traditional PC or a touchscreen device, will soon appear in Windows 10 Preview builds. Cortana on a Windows 10 PC. As anticipated, Microsoft’s Cortana digital assistant will make the jump from Windows Phone to Windows 10, assuming control of many of the operating system’s search features. Cortana, which will get her own place next to the Start button in the desktop taskbar, can perform many of the same basic tricks she does in Windows Phone. Cortana can be interacted with via text or natural voice queries, just like on mobile devices. Still based off Microsoft’s cloud-based Bing brains, Cortana can answer basic queries like “Will I need a coat tomorrow?” or how much it costs to attend the University of Washington, as Belfiore showed in live demonstrations. But Cortana’s also been tweaked for more useful PC-like interactions. She can scour your local machine, OneDrive account, and even your business network to find files based on natural language queries. 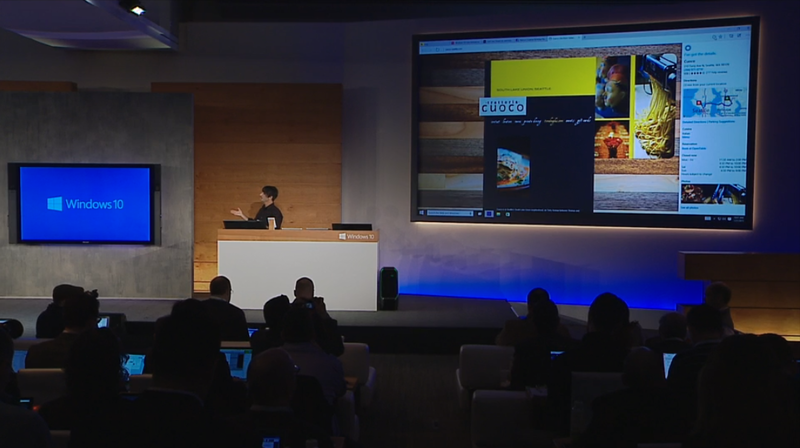 Belfiore showed off the capabilities by asking Cortana to “Find PowerPoint slides about the charity auction” and “Show me photos from December.” The digital assistant surfaced the desired information nearly instantly. That sounds pretty darn handy, and there are more playful commands, too: Telling Cortana to “Play my music” launches the music app, while asking her to “Please be quiet” silences the music. Nice! Belfiore then veered off to show Windows 10 on phones and tablets, including a brief demo of mobile, touch-friendly Office apps. Windows 10 for phones will basically act like an extension of your PC, featuring universal Windows apps that share the same central heart and design as their PC counterparts, as well as newly universal notifications that synchronize across Windows 10 devices. Windows 10 phones and small-screen tablets will include a free copy of Office. For a quick look at the universal Office apps, be sure to check out our article on Windows 10 for phones and tablets. After the mobile talk, Belfiore showcased a rebuilt version of Outlook designed for PCs, tablets, and phones alike as a universal Windows app. Strongly resembling the Mail app in Windows 8—at least aesthetically—the universal Outlook map will sport a unified look across device types, packing touch-friendly commands such as swiping left on a message to remove it, or swiping right to flag it for later follow up. Since many of Microsoft’s apps—including Outlook—have their heads in the cloud, changes you make to a universal app on one device will be immediately reflected on other devices, as Belfiore demoed by actively editing Calendar app entries simultaneously on a PC and a phone. Microsoft’s bringing the same cloud-centric, universal app experiences to its core Windows apps as well, all powered by OneDrive on the backend. The Photos app will create albums from all your devices, intelligently removing duplicates and burst photos. A revamped universal People app will collate your contacts, while the Music app is also receiving a universal overhaul. As rumored, Microsoft will add support for you to put your music collection in OneDrive within the next month or two, so you can listen to your tunes anywhere. Maps will also be receiving Cortana integration, and she'll be able to remember where you parked your car. Also new to Windows 10 is Spartan: A new, clean-looking, lightweight browser built around a new rendering engine. It won’t be available in the first Windows Insider builds, and it will only come to phones eventually, Belfiore said. The Spartan browser's annotation capabilities. The Spartan browser includes a note-taking mode that lets you annotate a webpage, then share your marked-up, commented-on version with others using Windows 10’s native Share feature. There’s also a clipping tool so you can save portions of websites directly to OneNote. Spartan also doubles down on the mere act of reading on the Internet. 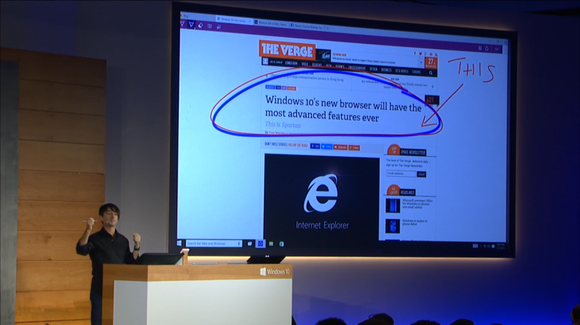 The browser integrates an updated version of the stellar Reading Mode found in Windows 8’s Metro Internet Explorer app. Reading Mode strips all the ads and sidebar crud out of webpages, formatting articles so that they appear similar to a book. It’s a wonderful thing. Spartan also taps into the Windows Reading List app, so you can save articles to read later, synchronizing the list across multiple devices. Unlike the Reading List app in Windows 8, the one in Windows 10 will let you save content to read offline. Cortana surfacing restaurant info in the Spartan browser. Cortana is also being integrated directly into Spartan. "Because she knows you, she can help in more nuanced ways,” Belfiore said, showing an example where searching for “Delta” in his address bar popped up information for the Delta flight Belfiore was scheduled to take later. Cortana will also pop up when you visit a restaurant’s website, surfacing directions as well as information about the restaurant’s menu, hours of operating, and Yelp reviews. 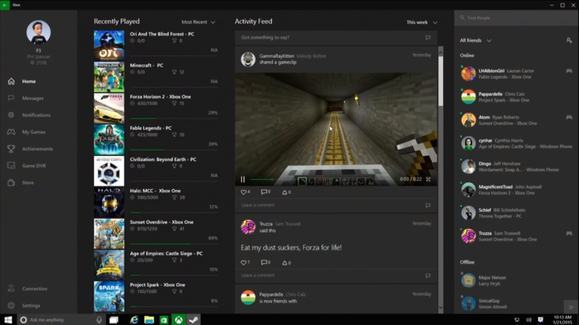 The Windows 10 Xbox app. Microsoft’s also bolstering Windows 10’s gaming chops by deeply integrating Xbox capabilities into the operating system. A new Xbox app essentially looks like a more fully fleshed-out version of SmartGlass, letting you chat with your Xbox Live pals, view your achievement information, or access game DVR clips. The app also lets you like, share, and comment on game clips. 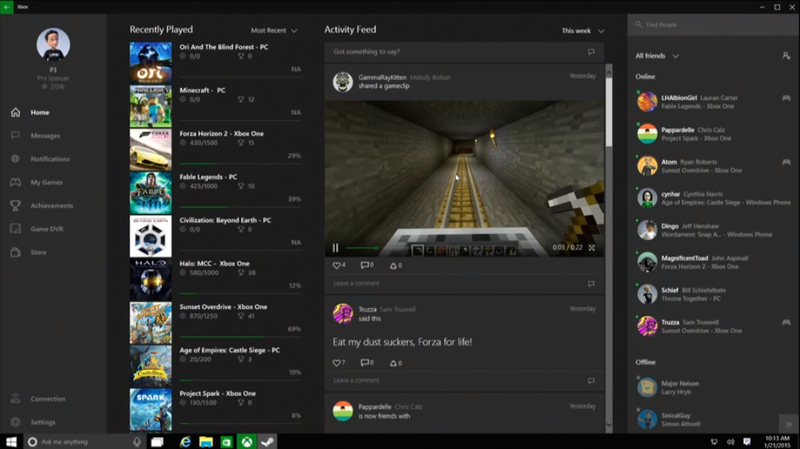 But Windows 10’s new gaming chops is about more than merely expanding Xbox’s footprint. While you’re playing traditional PC games, be it in Steam or otherwise, a new Windows key + G keyboard shortcut brings up an interface for saving snapshots and 30 second video clips of your adventures, which then brings you into the Xbox app to share it. 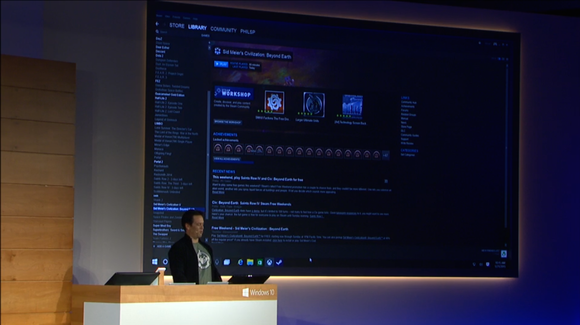 Games don’t directly have to support the functionality as it’s being overlaid directly by Microsoft in Windows 10. Windows 10's new screenshot- and video-capturing tools will work with any PC game, including Steam games. As previously announced, the performance-enhancing DirectX 12 gaming API is also coming to Windows 10. Xbox head Phil Spencer claims that the API can deliver up to a 50 percent performance improvement in games. Microsoft also wants to enable more gaming experiences regardless of the device you’re using. Fable Legends players on Windows 10 and Xbox One will be able to play with each other, and you’ll be able to stream your Xbox One games directly to any Windows 10 device, though it sounds like it will be limited to local networks only, similarly to Steam in-home streaming. 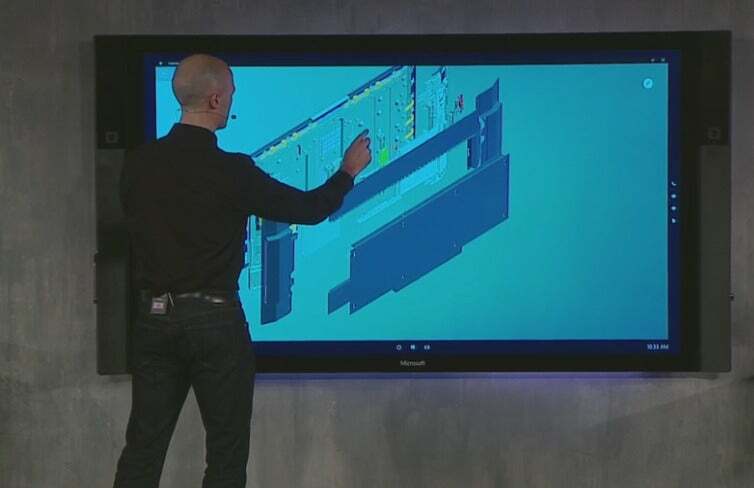 This has nothing to do with Windows, but it's a major—and unexpected—hardware announcement from Microsoft: The company's rolling out the Surface Hub, an 84-inch, 4K, touch-enabled display for office collaboration. You can read the full details here. Windows Holographic will build 3D imaging into Windows 10, which can be experienced using the HoloLens headset. And the Surface Hub isn't even the craziest hardware announced by Microsoft today. 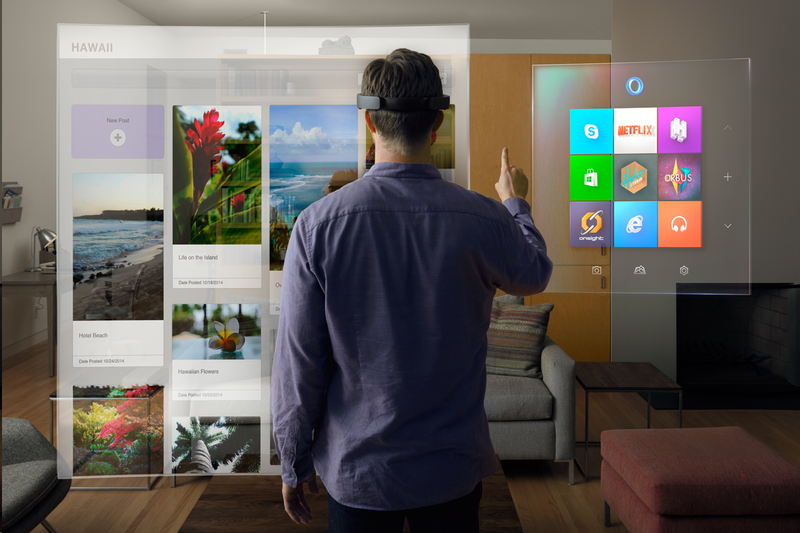 That honor goes to Windows Holographic, a set of technologies—a headset, new Windows 10 technology, and a HoloStudio dev app—that brings some insanely intense augmented reality capabilities to Windows. You'll definitely want to check this out. Myerson also revealed some stats from the Windows 10 Technical Preview. Thus far, more than 1.7 million people have registered for the Windows Insider program, and they’ve installed Windows 10 on more than 3 million different PCs. A fresh Windows 10 Preview build containing the newly announced features will hit PCs next week, with a Windows 10 build for phones becoming available after the Super Bowl. Here's how to get started with the Windows 10 Preview.